N'Golo Kante thinks Ruben Loftus-Cheek is ready to break into the Chelsea first team and make an impact in the Premier League. The 22-year-old, who started England's friendly victory over Switzerland in midweek, impressed while on loan at Crystal Palace last season, helping keep the Eagles in the Premier League before earning a call-up for England's World Cup squad. During the transfer window, he opted to remain at Stamford Bridge in an attempt to break into the first team on a regular basis under new boss Maurizio Sarri but so far, he has struggled to do so, playing just 33 minutes of football in two substitute appearances for the Blues this term. It has led to suggestions that Loftus-Cheek could head back out on loan in January, but Kante, speaking ahead of the Blues' Premier League clash with Chelsea, thinks the Englishman's time will come at Chelsea. "When I came to Chelsea Ruben was already here and for sure he is a good player," the World Cup winner told Sky Sports. "Now he's in the England squad. He did well last season at Crystal Palace and I think he's ready to play. "He's played some good games and now it's the manager's decision. We all have the chance to be at Chelsea and to play with some of the best players in the league. "We can all learn from that but he needs to keep working, to keep improving and I hope it will come at the right time." He only made his professional debut in May, 2012 but since then he has enjoyed a rapid rise from playing in France's sixth division to Ligue 1 to winning the Premier League with both Leicester and Chelsea. And Kante insists it was the difficult times that made him stronger as a player. "Everybody has some difficulty at some point in their careers but we need to use this moment to build ourselves as a player and learn from that," he said. "I had my difficulty when I was younger but now I cannot say I didn't deserve that. It helped me to build myself as a player and as a person. "The only thing is to use it as a thing to learn and improve." Kante is having to adapt under a new manager this season in Sarri. The arrival of the Italian at Stamford Bridge has meant a role change for the 27-year-old. New signing Jorginho is now playing as Chelsea's deepest midfielder with Kante playing a little further forward in Sarri's system, which has helped the Blues start with a perfect four wins from four games in the league. 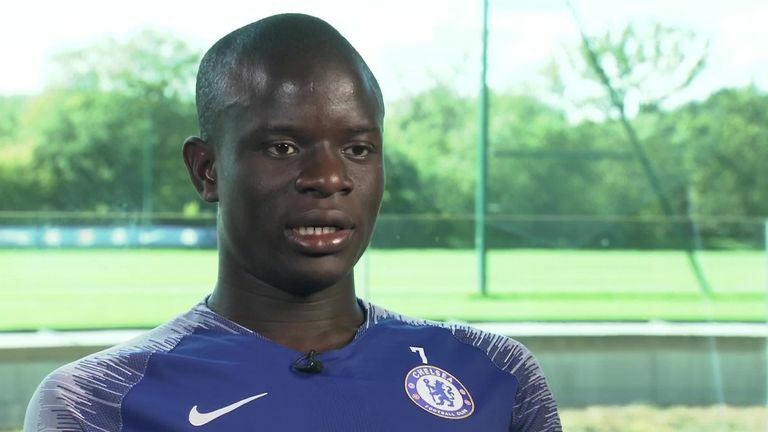 And it's a role Kante, who scored only the fourth Premier League goal of his career in his side's opening day win over Huddersfield, is enjoying. "It's a new system with a new manager, new players and I enjoy being in this position to try and sometimes be in the box and then to be back defending, but I'm enjoying this new position. When asked about scoring more goals, he added: "I will be more in front and I've already got many chances. I need to understand that in this position I will have to score to make a difference for the team. I need to be ready for that but I haven't got a target. "If I don't score anymore but the team keep winning and I'm helping the team I will be happy. However, when I do have the chance, I'd like to score of course."